Robinson Nature Center's been open for almost five years, and all it took was the promise of chocolate all over my hands and wine coating my tongue to get me to cross the threshold. I almost didn't make it; I tried getting tickets to their Truffles and Wine Tasting event last year, but it sold out in record time. This year, I tried even earlier, but I was still too slow. Lucky for me, my name topped the wait list, so when they added on another time slot for the event, I was the first person they called. Come to me, chocolate. Come to me now. The Valentine's Day-themed event began with half of our group in the wine tasting room, and the other half (the half Joe and I were in) beginning with truffle making. I gotta say, it's pretty cool to be part of a boozy event that starts at 11:00 in the morning. The truffle making kicked off with a presentation showing the process of bringing the cocoa plant "from bean to bar" - fruit harvest to drying to roasting to grinding to separating to chocolate-ifying (basically, adding sugar and milk in whatever proportions you need to make the desired type of chocolate). Next, the presenter explained that the truffles we'd be making would be comprised of two things: ganache and toppings. The ganache itself was made up of two things: chocolate and cream. So simple, like many of the best things in life. We were able to watch the ganache-making process thanks to a video camera that was hooked up to a projector. It was actually really simple, though took a bit of panache. Ganache takes panache. As soon as the cream started bubbling, the presenter took it off of the heat and added the chocolate, stirring it until it was a melty gooey chocolatey concoction. To simplify things (and also, I'm sure, to prevent a visit from the health inspector), the team had already made everyone a bowl of ganache, which had been slowly coming to a more malleable temperature before the class began (Ganache has to be chilled for at least two hours before you work with it). After they passed out the bowls of ganache, they introduced us to the six different toppings we could use to garnish our truffles: crushed pretzels and graham crackers, rainbow nonpareils, sparkly gold sprinkles, cinnamon, and coconut. Since Joe was with me, we were able to get all six toppings. We should've just gotten six portions of rainbow nonpareils. Those things are so freakin' awesome. I diligently tossed my ganache balls in each of the six toppings, like the teacher's pet that I am, so I could get the full experience. But those nonpareils kept calling out to me. I blame Lisa Frank and her cornering of the school supply/pocket folder/Trapper Keeper market in the early 1990s. Rainbow addiction for life. After all of the truffles were made, our hands were quite literally covered in chocolate. That's how you make truffles, you see. 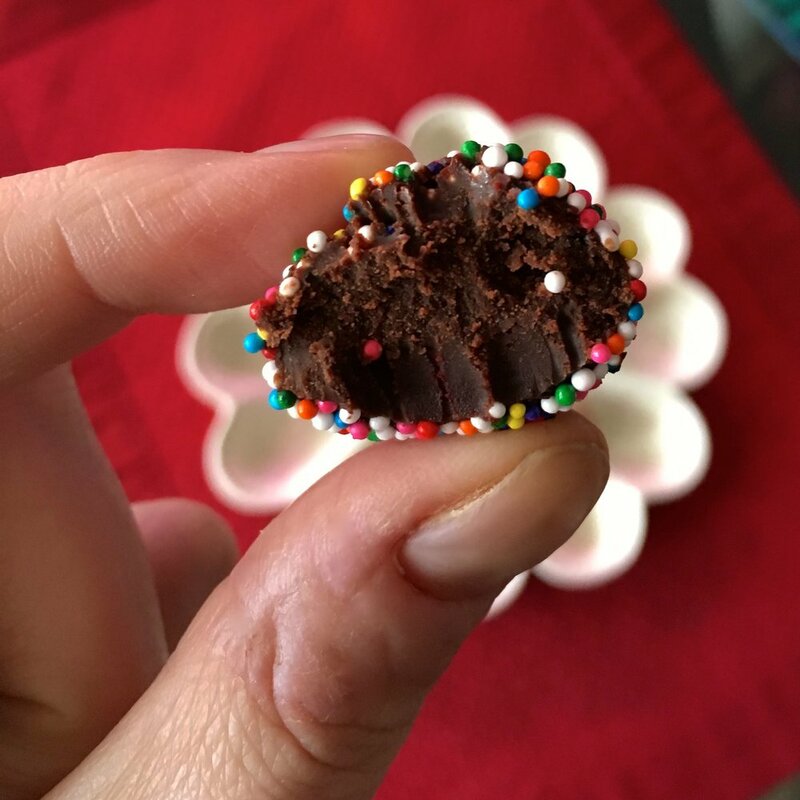 You spoon out a bit of ganache, and very quickly roll it into a ball using your palms. You have to do it in a few seconds, and apply just the right amount of pressure, lest your body heat melt the chocolate even more. It's a delicate balance, and a delicious one at that. I was the weirdo who literally licked my hands clean because I didn't want to get up from my chair and wait in line to wash my hands at the single sink on the room. Plus, let's face it: it was an excuse to lick chocolate off of my hands. Who's the weirdo now? 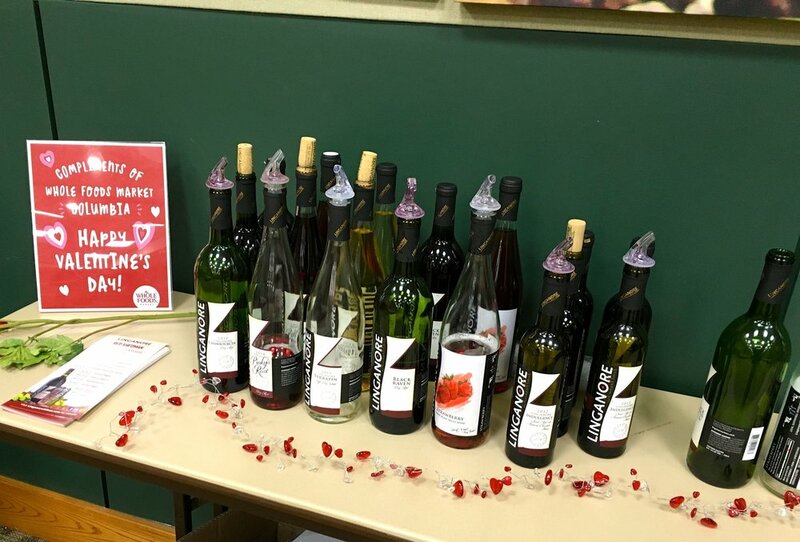 The wine tasting was next; a rep from Linganore Winery was on hand, armed with half a dozen different varieties of their wine. He told us about the sustainable practices Linganore employs (a big push from Robinson Nature Center is sustainability; the building itself is a LEED certified Platinum project). The wines were good, though most of them were on the sweet side for me. I can't believe I just said that. I used to only drink Moscato, for crying out loud. Oh, how times have changed; nowadays, I'll take a chewy, spicy, deep, dark red over a Moscato any day. Well, unless I'm worried about Red Wine Mouth. But I digress. We walked around a bit afterwards, our red- and pink-striped truffle boxes in tow. Robinson Nature Center is really cool. I wish it hadn't been negative a zillion degrees outside, or we would have strolled the grounds. I was bummed we couldn't play on the playground. We did, however, visit the milling exhibit and spin the big wheel to see how the inside of a mill works. Yes, I'm a giant child who licks her hands clean and wears skirts with cupcakes on them and wants all the rainbow sprinkles.